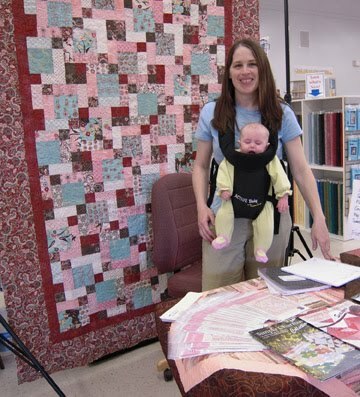 We had a great time meeting quilters in Southern Arizona last week. I say we because my baby got to come along. She loves people talking to her, so she did well. See the quilt behind me -- there's a preview of one of the patterns in my next book. It isn't even bound yet! One highlight was meeting this quilter (whose name I didn't write down quick enough -- sorry! -- I'm pretty sure it started with J). She brought a quilt she had made from my Simply Charming Collection book. I love seeing what people have made from my patterns! She also gave me a couple great suggestions that I will be implementing in my next book. Time for more winners -- yeah! This time there were three prizes, so we have three winners! These are the Flickr usernames. I have emailed both winners via Flickr mail which should come to you whatever email you signed up with. I posted the blocks to help identify the winners. Contact me to get your prize. Remember, if you didn't get your block done, no worries, there is still time. There will be another drawing in two weeks. 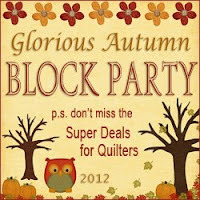 Any blocks posted between now and then will be entered in the next drawing. 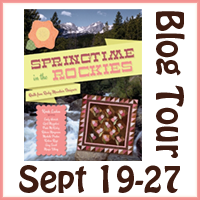 I am so pleased to introduce you to Debbie Maddy! Debbie is someone who I didn't know I knew. Since she said she would be one of designers, I have seen her everywhere. Now that you have met Debbie, maybe you will too. Thanks Debbie! 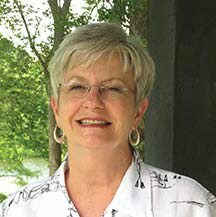 My name is Debbie Maddy and I live in a small town in north Texas with my husband of 40 years. We have two grown sons. Probably like many of you, I learned to sew as a young girl. 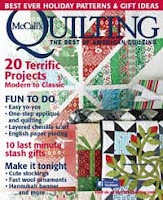 I did all kinds of needlework and was a garment sewer until I learned to quilt. My first quilt was a king size sampler cut with paper templates and hand stitched. When I discovered the rotary cutter I felt like I had been riding a horse and had bought a new car. I soon learned how much I enjoyed sharing my knowledge. I now travel to lecture and teach for guilds and shops around the country. 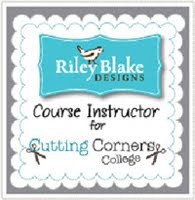 I have tried to put a lot of energy into teaching new quilters and designing quilts using what I call my No Diamonds / No “Y” Seams technique. The quilts are based on old designs that used diamonds, but are made with half square triangles. 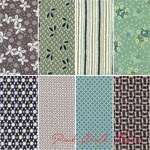 My pattern company is called Calico Carriage Quilt Designs®. 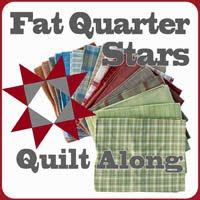 My first pattern was called Carpenter’s Star and is great for beginning and experienced quilters. I now have 34 patterns and 6 books. 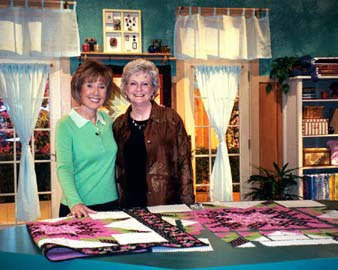 I was invited to tape a segment of Simply Quilts with Alex Anderson and that was a wonderful adventure! I started my blog (http://www.calicocarriage.com/blog/ ) because I really enjoy sharing my travels and experiences with others. I like to share the pictures of classes to inspire others to start something new and to share the fun of taking a class. I share the places I travel to because I enjoy reading about where other people have been. 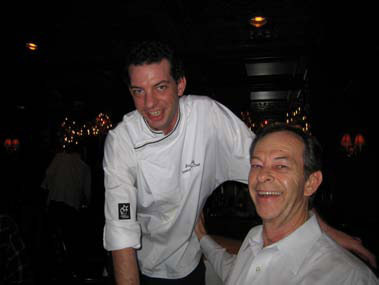 I share recipes and restaurant information because food is a very important part of our lives. My youngest son and his wife are both professional chefs. I hope to meet many of you on my blog or in my travels. Please check out my itinerary to see if I will be in your area. And now here's block three! CLICK HERE for the instructions to Debbie's block she named In & Out Block! 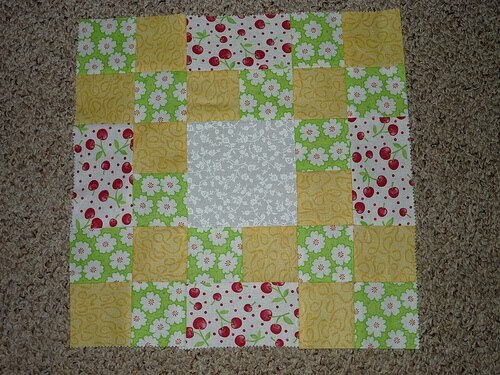 This picture is the block Debbie made. I will get mine up here today. I got in late last night after an impromptu trip out of town all week so I didn't get my block made. 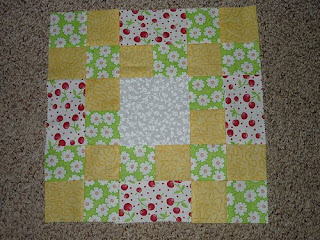 As you some of you can tell, this block will practically sew itself! Can't wait to see what it looks like in all it variations. Late tonight I will post my pictures on Flickr. Whoever has their blocks posted before mine will be entered in the drawing tomorrow. There will actually be three prizes tomorrow, three chances to win. Yeah!!!! Anyone in Southern Arizona this Wednesday is welcome to come by The Squirrel's Nest. 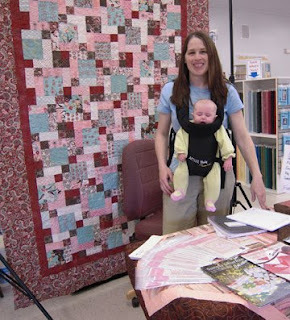 It is a great quilt shop off of Highway 92 on the South side of Sierra Vista. I will be there from 1:00 pm to 2:30 pm for a book signing. I would LOVE to meet you! 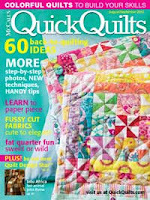 I am bringing two quilts from my new book -- that isn't even at the publisher yet! For better or worse, I ended up at Rachel Griffith's blog, p.s. 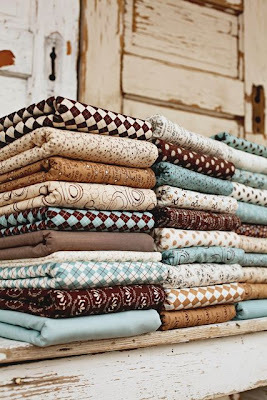 i quilt, and read about Hope Valley, a fabric line by Denyse Schmidt for Free Spirit. I have seen this fabric line a few times before, but this time when I saw it I got itchy fingers. You see, this time I saw the fabric, I had a quilt that is in the works that needed just the right fabric. Also, this time when I saw the fabric I overlooked the orange and bright pink. This time when I saw the fabric, I got itchy fingers. Do you know that feeling? I'm sure I'm not alone. It's that feeling that the stars have aligned, that the perfect fabric has been paired up with the perfect pattern and you just can't wait to get started. You get that, "I need that fabric NOW!" feeling that doesn't pass until you have the fabric in your fingers (or at least on its way to your fingers). Thank goodness there are quilt shops that are open at midnight. 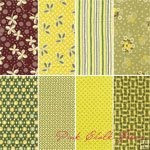 I ended up at Pink Chalk Fabrics where I could buy the fat quarter bundle without the orange and pink. The other good news -- I am in Utah, and they are in Washington so I should have Hope Valley in my hands tomorrow! It all my fingers fault. When they get itchy, I can't wait to get to my sewing machine. Thanks a lot Rachel -- for giving me the itchy fingers! 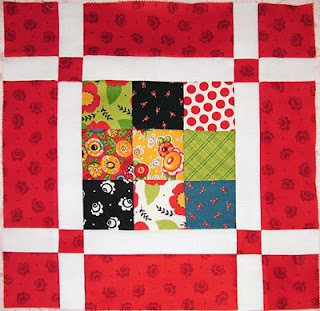 It is so fun to see all the great quilt blocks being posted! 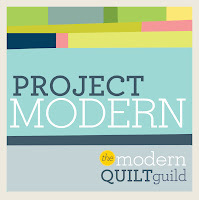 I can hardly wait to see all these quilts come together. Remember, if you didn't get your block done, no worries, there is still time. There will be another drawing in two weeks. 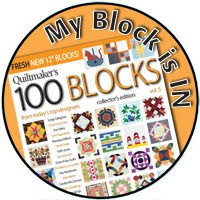 Any blocks posted between now and then will be entered in the next drawing. This block was so fun that I couldn't make just one -- I made two! BUT you will see them in a minute. First, meet our block designer for today, April Mazzoleni! April is a friend of mine. 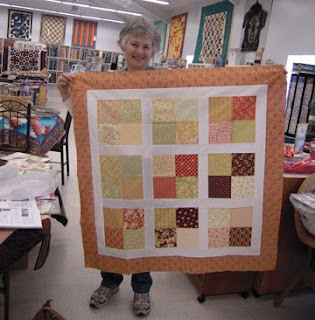 She is also a quiltmaker with a great eye for design. Check out her blog, you will see what I mean. 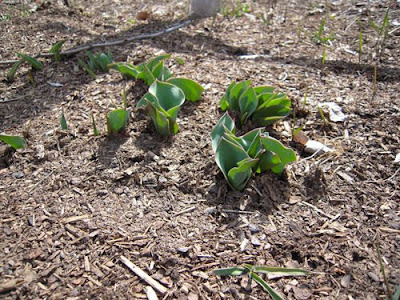 Here's April. . . .
Once all of my kids were school aged, I had found myself at home with a lot of time on my hands. Too long to just sit around and wait for everyone to get home and not long enough to get a real job...plus I had already done the real job thing for 15 years and just couldn't go back. I dusted off the sewing machine that my parents gave me when I turned 18 and started sewing. With my mom two states away and no one around to help, I jumped right in. Sewing has changed my life in sew many ways. It's given me a creative outlet, provided me with an income and has helped me to make many friends along the way. For me blogging, sewing and friends have gone hand in hand. I started blogging about 2 years ago now and love it. It's not about the number of visitors or the number of comments (although comments are always fun to read) it's more of being part of a community, keeping connected and sharing that part of myself with family and friends. 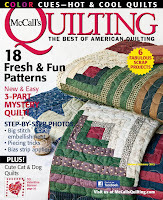 While I've made a lot of original quilts, I haven't published many patterns. With the encouragement of friends, I'm throwing my hat in the ring. 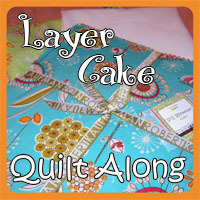 My first pattern for a quilted version of a Quiet Book is now available for purchase at woodchesters.etsy.com. Besides my love of quilts, my other passion in sewing is my cloth mama pads. While my initial reaction to cloth pads was - Yuck! - something about them kept tugging at me. I finally made up a few, fell in love with them and wanted to share them with the world :) Besides selling them at my etsy shop aprilmdesigns.etsy.com, I also want to help make people aware of the health benefits associated with them. You can find all of that info at my website http://www.clothmamapads.com/. 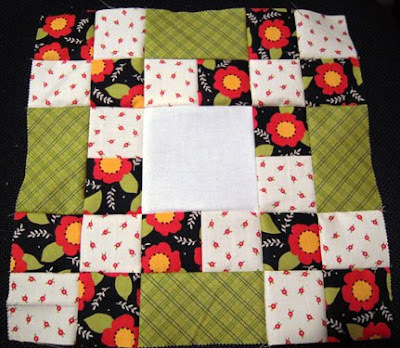 I'm saving my scraps to make a cloth mama pad quilt one day. The best of both worlds! Thanks April! 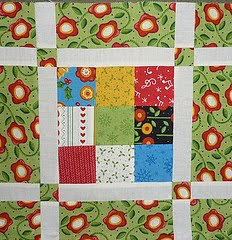 And CLICK HERE for the pdf of Block 2 designed by April! 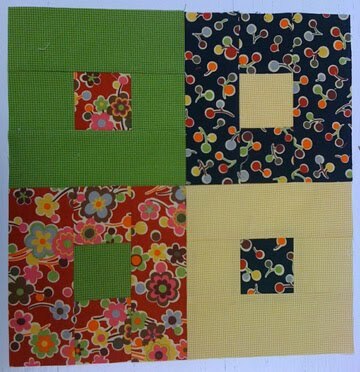 Here are the two blocks I made using April's pattern. First, I made the design in my Attitude Girls jelly roll. It turned out, of course, very high contrast because Attitude Girls has, well, attitude. So I had to make one with low contrast. I found over half a Swanky jelly roll sitting around with nothing to do. I decided to let my Swanky jelly roll join in the fun. We will see how far she makes it. 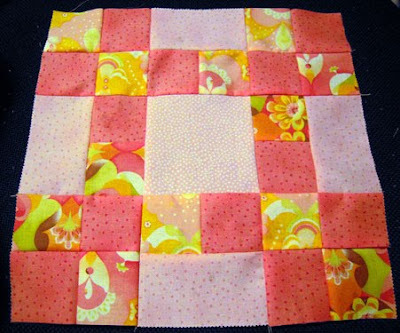 The center square is a pink with white dot print that is going to be my background fabric for this one. My apologies for these blocks. They have not received their final pressing yet. I know I shouldn't let them be seen this way. Sorry. Are the quilt police going to call me in for questioning? Okay, so a couple other items of business. I type these up Saturday night so they will post before I can get to the computer Monday morning. The link will be on the main page shortly. Sew, sew, sew, you have today to finish block 1! 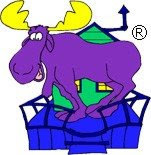 Late tonight (Mountain Daylight Savings Time -- I do not like daylight savings time by the way -- too much information -- oops!) 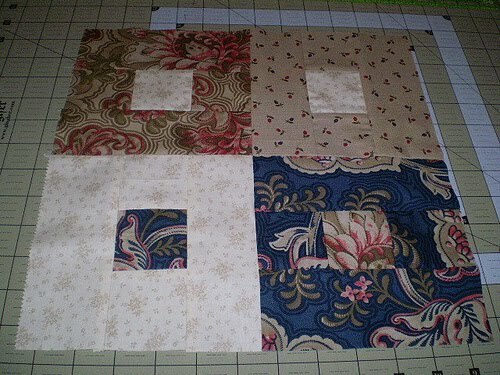 I will post my two new blocks on Flickr. When these two blocks are posted, every block before my blocks are entered into the random drawing for two fabulous prizes that will be announced tomorrow. Question: What about the speed demons who finish Block 2 before I get my Block 2 posted? Answer: Speed Demons, you have a choice to make. If you post your block, you will have two chances in tomorrows drawing because you will have two blocks posted. Or you can wait until after I post mine to be entered into the next drawing. I will leave the decision to each of you. This week I have discovered two other things that take forever to happen. 2) A fabric line to make it into my hands once a designer shows us a gorgeous preview. This one is Pure by Sweetwater. I am in love with the browns in this collection! 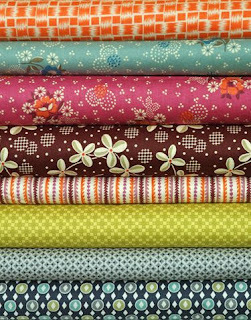 I would love to have some of this for the new patterns I am currently designing, but it won't be out for m.o.n.t.h.s. . . . They are having a drawing with the introduction of this new line, so you may want to head over to their blog before Monday. HERE is the link. Remember to post your Block Number 1 if you haven't yet. 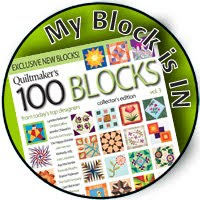 Add you picture to the hundred of fabulous blocks we have already. The next block will be announced Monday. Can't wait to show you! Last night I made three tutus. One of my daughters is going to be a dancer in a school play, and I thought this would be the easiest costume. If I was making one, I may as well make three. It would make my life easier to not have three girls arguing over just one. I got over twelve yards of pink, purple, and while tulle. What a pain! I was able to cut through all of the layers at once so it wasn't bad as I thought it would be. The top layer or two kept trying to fly away though. The worst part was cutting it all in half along a fold I could hardly see. As I started tying the tulle on the elastic, I started thinking it was going to a miserable evening. Then as the elastic was twisting and turning, I thought to have one of the girls put it on. It was pretty slick to tie the tulle strips on while the girls were wearing the elastic waistband. The strips of tulle are not even at all. I did it fast, and I didn't trim the length. I am glad it didn't turn into a UFO (Un-Finished Object). I dreaded having a pile of tulle strips floating around. I think it took a couple hours to make all three start to stop. There's tutorials all over the internet if you want to make one. I can't say I enjoyed making them, but it went pretty quick after I got the tulle cut. Where's Moda to make my precut tulle strips?!? Or I guess, I got mail . . . . Friday I got a package. Something I have known about, but frankly, forgotten about. 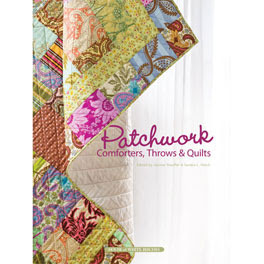 It was a book published by House of White Birches called Patchwork Comforters, Throws, & Quilts. 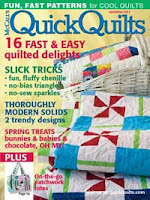 One of my quilt patterns is in it. My pattern is called "Purple Pandemonium." The books is really well done. 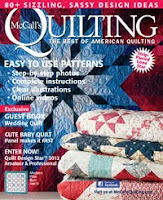 I love the cover quilt. I sent them the information a year ago, so I had almost given up on it. I guess that's just how long it takes. Fun surprise! This yogurt is my new addiction. Caramel Yoplait Delights. I have one every day. Once I had my local grocery store order me a case (6 boxes) when the other grocery stores were out of it. It has even taken the place of ice cream for me. Sometimes I put Grape Nuts in them to make them crunchy. Lately, I have taken to sneeking my yogurt. See my two year old likes my yogurt too. I cringe when she sees me with it because she always runs over and wants to share. I'm always a good little girl and share with my daughter, but I don't want to. I try to give her tiny two year old bites, and then I eat it fast so I can get most of it. Is there something you don't like to share? Thanks to everyone signing up! I am SO loving all the blocks that are coming in! I sent an email to KatieQ, but elsemarie I need you to contact me with your address. Keep the blocks coming, they are fabulous! March 1st has finally arrived. Let the games begin! 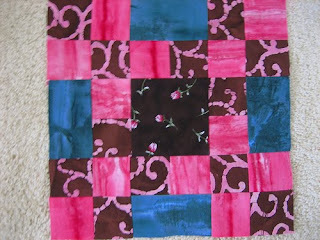 Here is Block #1 in our Jelly Roll Sampler Quilt Along. Click here or on the picture of the block below for the link to the pdf that contains the directions to create block #1. 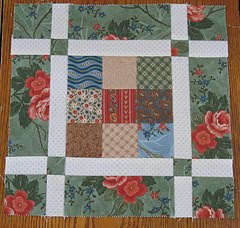 After you make your block, upload a picture on our new flickr group here, or use the link on the right side of the blog. I can't wait to other blocks besides mine on the rotating flickr badge. Are you ready for the first drawing?! I will post winners tomorrow. Sorry. I couldn't stand winners being hidden at the bottom of a post, and I couldn't stand posting twice in one day. 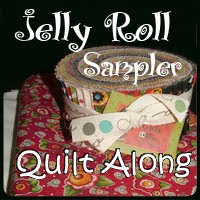 Prize 1) A Jelly Roll courtesy of Fat Quarter Shop.